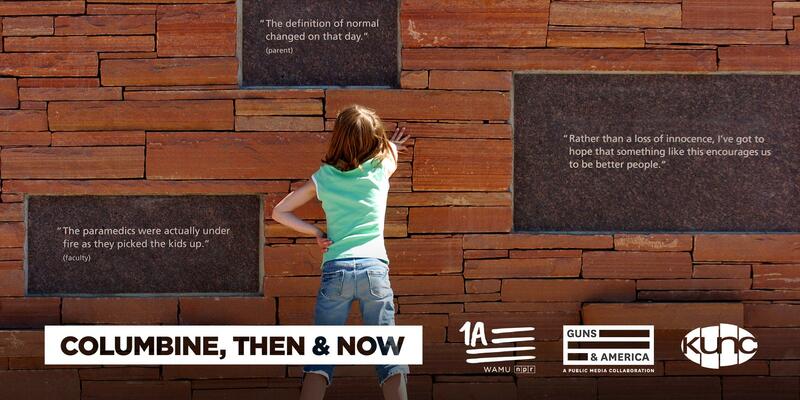 The Columbine Memorial opened in 2007, eight years after the shooting. The design includes remembrances by the victim’s families, quotes from community members, shrubs, flowers and a fountain. November 7, 2000 — election night in Denver, Colorado — was a big night for Tom Mauser. He had a big smile on his face as he made his way to the podium at a venue in Denver that he remembers as a sort of art studio or museum. "It was heavenly. It really was heavenly," Mauser recalled. That night, Mauser was at the victory party for the passage of a Colorado ballot measure called Amendment 22, which closed something commonly called the "gun show loophole," by requiring background checks for firearm purchases at gun shows. At the podium, Mauser reached down and held up a pair of large white sneakers. "In Daniel's shoes," he said. Over the years, Mauser has continued to wear his sons shoes to significant events and, in 2012, published a memoir, Walking In Daniel's Shoes. "I could say, you know, we did this in Daniel's name," Mauser said. "The people of Colorado did it and he provided the inspiration for it." Mauser's son Daniel was one of the 12 students killed at Columbine High School on April 20, 1999. "I know some people would say, 'Oh, gee, isn't it bittersweet? You know, you're still just a little more over than a year since the tragedy,'" Mauser said. "But no, that was just one of the great moments." Tom Mauser at his church in Littleton, Colorado. His son Daniel was murdered 20 years ago during the shooting at Columbine High School. In his retelling of the day Daniel was murdered, he talks of a steady progression, from seeing something about a shooting on the news, to waiting around at a local elementary school for more information, to being asked what Daniel was wearing that day, and then for his son's dental records. That night, the sheriff's office called to say that there was still no final word on Daniel. "So we went to bed that night not knowing if Daniel was dead or alive," Mauser said. "We just had some faint hope that maybe he was in some room someplace hiding. And then it wasn't until noon the next day that the sheriff's office came to our house and gave us the bad news — that he was one of the victims." But, he also points to one very specific moment. "Just two weeks before his death, Daniel asked me a question at the dinner table out of the blue," Mauser remembers. "He said, 'Dad did, you know there were loopholes in the Brady Bill?'" The Brady Bill, passed in 1999, is a national law that requires background checks when purchasing a handgun from a gun shop. "And I just kind of didn't pay much attention. I said, 'No, I didn't know there were loopholes,'" said Mauser. "Daniel, two weeks later he was killed with a gun that was purchased through a loophole in the Brady Bill." 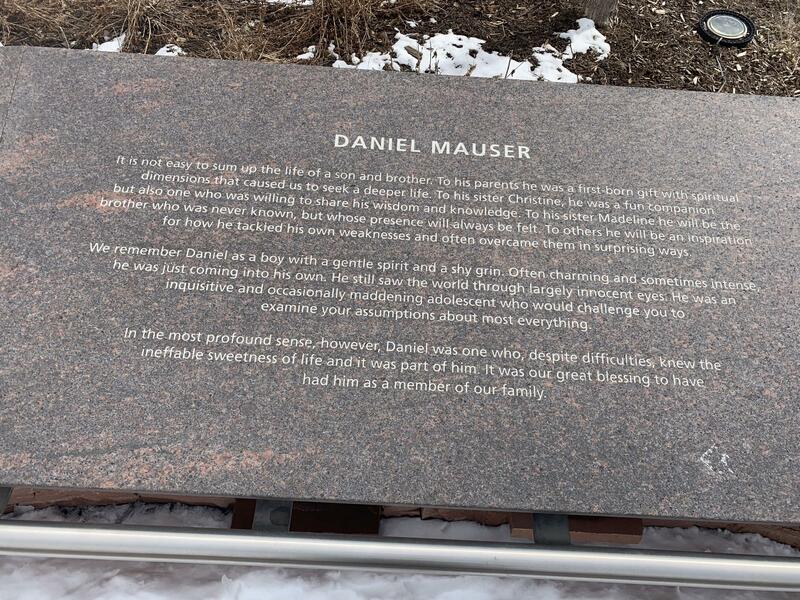 The marker for Daniel Mauser at the Columbine Memorial. Mauser responded by getting involved almost immediately — starting with protesting the NRA's annual convention — which was scheduled to take place in Denver less than two weeks after the shooting at Columbine. The 1999 annual convention was scaled back, but was not cancelled. On the day of the event, news organizations reported that thousands of people gathered around the convention site in protest. Tom wasn't planning to speak, but he did. "A TEC 9, semi-automatic, 30-bullet weapon like that that killed my son is not used to kill deer. It has no useful purpose," Mauser said at the protest outside the convention center. "It's time to address this problem." Inside, at the convention, then-NRA president Charlton Heston talked about how the tragedy had been politicized. He criticized media coverage. But Heston also spoke of how the right to bear arms is not a right without rational restrictions. "We believe in absolutely, gun-free, zero tolerance, totally safe schools," LaPierre told those gathered inside the convention center. "That means no guns in America's schools. Period. With the rare exception of law enforcement officers and trained security personnel." LaPierre has since changed his tune. In the aftermath of the shooting at Sandy Hook Elementary School in Connecticut, he called for armed police officers in every single American school. Mauser's push for gun control continued after the NRA's annual conference. 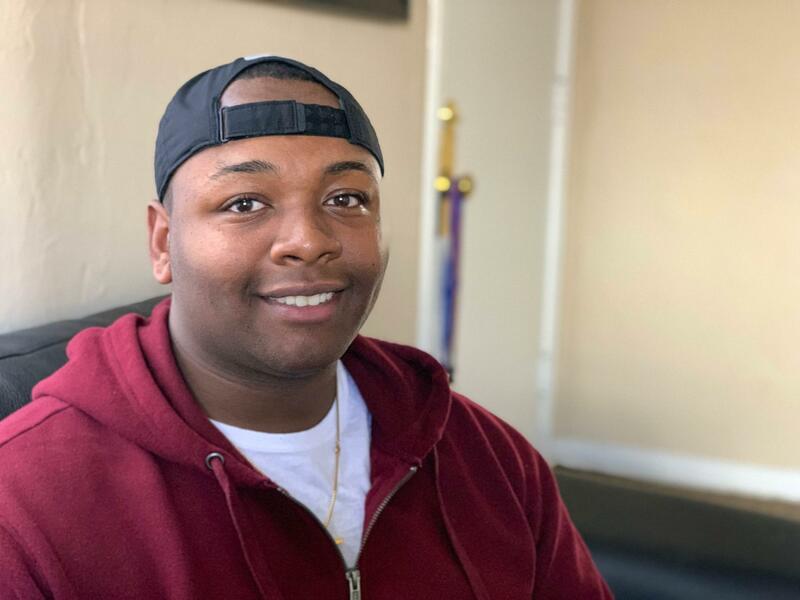 He traveled to Washington, D.C., to talk to lawmakers about closing the gun show loophole; he lobbied state legislators on a handful of measures to reduce youth violence. While many of the legislators he spoke with expressed condolences, "I also heard through other channels that the feeling of some of those legislators was that I really shouldn't be there," he said. "That having a grieving father, they're like, that that's not appropriate. I think it made them feel uncomfortable." After striking out in the Colorado Legislature, Tom and others turned their focus to the November election and pushed for a ballot measure in Colorado instead. Amendment 22 required background checks on sales at gun shows. Mauser met with different stakeholders across the state from district attorneys to sheriffs, all in pursuit of one goal: "How do we work together to close the gun show loophole?" In the months after Columbine, life for Mauser and his family was crazy. He was working a full-time job, lobbying on the side, grieving, going to Columbine-related events, and, with his wife, adopted a baby girl from China. "That first year, that year, I look back on and I think of what all we went through," he said. "I don't know how we did it." In the end, Tom helped close the gun show loophole. Amendment 22 passed in November of 2000, with 70 percent of the vote. But after that, the movement kind of dissolved. Mauser has stayed active, but, back then, he says that a lot of people felt as though the goal had been achieved. They moved on. "Today, it's just so different because of social media," Mauser said. "I think that in 1999 when students reacted, it was just out of shock and fear and just a general, 'Oh my God.' And here it is 20 years later and they're saying, 'but wait a minute, this is still happening. This is part of us now too.'" Mauser says seeing a new generation of students speak out for gun control is exciting for him. Sometimes he wonders if his son Daniel had survived, if he would be part of the activism. "We didn't really have that back in 1999. But their voices are so strong and they reacted so quickly," Mauser said. "It's so encouraging for me to see that happen." The conversation now, according to Mauser, is more sophisticated: banning bump stocks, passing extreme risk — also known as "red flag" — laws that allow firearms to be temporarily taken away from someone in crisis. Earlier this month, after passionate debate and disagreement, the Colorado Legislature voted to pass such a bill. "We're seeing so many more options and things that we have to address and our gun laws," said Mauser. "And of course, we're also seeing a lot more resistance in some respects. I think we're seeing both more support and yet a stronger resistance than we had back in 1999." 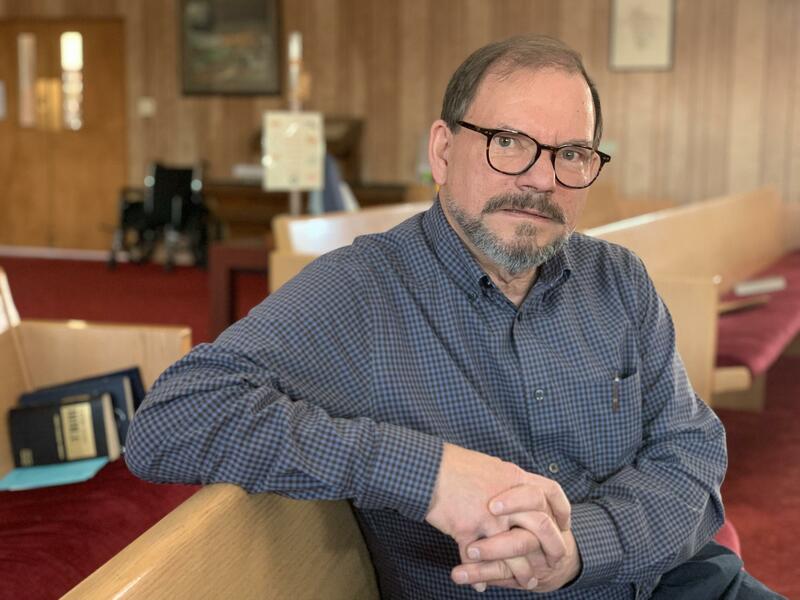 These days, Tom Mauser feels as though he is passing the torch on to a group of highly motivated young people, many of whom weren't even been born in 1999 when the shooting at Columbine High School happened. Young people like Emma Gonzalez and David Hogg, who got involved after the 2018 shooting at their high school in Parkland, Florida, have amassed millions of followers on Twitter. But there are also many other young people doing the work in communities across the country. Twenty-year-old Tay Anderson works at North High School in Denver, Colorado. He's also running for Denver School Board. Anderson advocates for gun violence reduction from two perspectives: wanting to keep kids safe in schools and wanting to keep communities safe. "In 2016, on my birthday, July 5, Philando Castile was murdered," said Anderson. "And I got tired of losing unarmed African American males because that could have been me. Trayvon Martin could have been me." The Parkland school shooting compounded that feeling. He became president of a youth-led organization called Never Again Colorado and gave a speech at the March for Our Lives event in Denver last year. Earlier this year, Anderson lost a former coworker, TJ Cunningham, to gun violence near Denver. Cunningham had been an assistant principal at a school where Anderson worked. "And he had his one day where the press was all about it and it was buzzing everywhere," Anderson said. The media moved on relatively quickly, he said, and it struck him in sharp contrast to the coverage he had seen of school shootings. The 2016 shooting death of a black man named Philando Castile motivated Tay Anderson to become active in the anti-gun violence movement. "You'll always remember these names of these schools that have been shot. And we see in a system where when people of color die, it's normal," Anderson said. "But when a mass shooting happens, then it's our thoughts, our prayers. We have to send help, we have to change laws. We don't have laws being changed for us every single day. And we don't have to talk about Chicago to talk about people of color when it comes to gun violence." According to a new study published in the American Journal of Medicine, 38,942 kids in the US were fatally shot between 1999 and 2017. The authors noted a steep rise in deaths among black children beginning in 2013. "It happens everywhere," said Anderson. "And we have to pay attention to it everywhere because it's not just saying Chicago and white suburban areas (that has a gun issue). It's the United States of America that has a gun issue." Across the country, students now experience lockdown drills and rely on key fobs or IDs to gain access to school buildings that are patrolled by school resource officers. Many of these security procedures were put in place after Columbine. 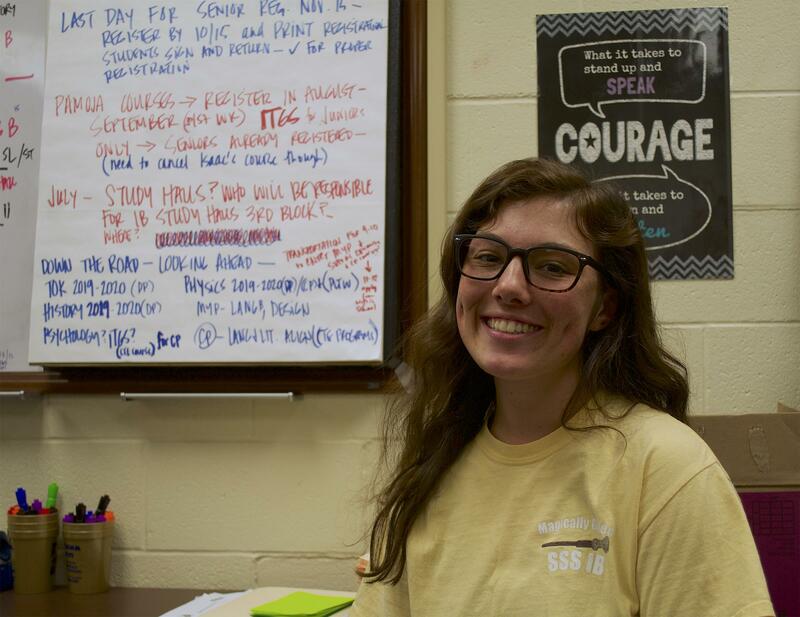 Emily Wall is a high school senior at Cleveland High School in Johnston County, North Carolina. When she experienced her first lockdown drill — or code 300 — at an early age, the testing of the alarms caused a tremendous amount of anxiety. 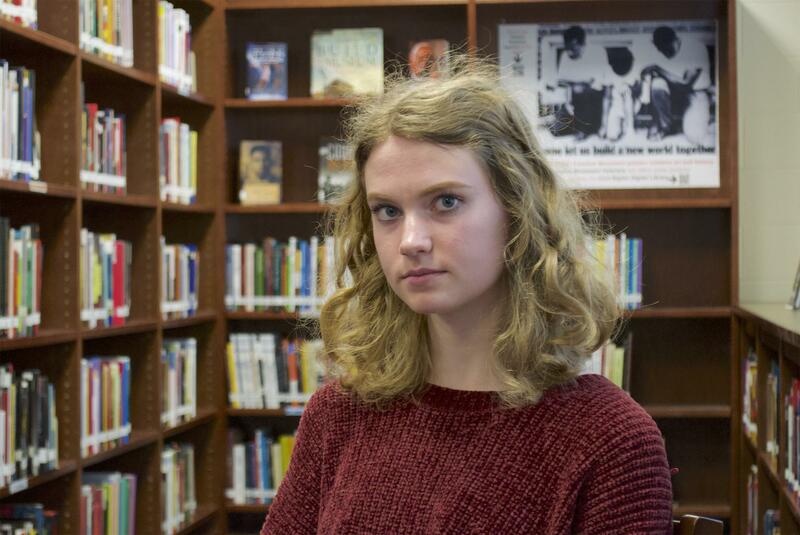 Emily Wall, a high school senior at Cleveland High School in Johnston County, North Carolina, says the experience of her first lockdown drill almost caused her to have a panic attack. "I was like, 'I think I'm going to have a panic attack. I think this is real,'" Wall said. "I don't know what's going on. This has been going on for too long. And so that's the only time that it really stress me out. But ever since I was in elementary school we've always been on a fire drill. Like if we hear it and we know what to do with, if we hear code 300 we know what to do because it's been built into us from such a young age." Overall, there's very little evidence to suggest what type of physical security actually works. And it turns out that in practice, lockdowns are actually used for many other things: when there is a robbery in the neighborhood or a report of somebody in a nearby school with a gun. But for many people, parents, teachers and students these measures make them feel safer. Delanie Vanchoff, a 17-year-old high school student in North Carolina, says that recently there was a threat at her school. Some of her classmates got really upset. Delanie Vanchoff, a 17-year-old high school student, wonders why the threat of being paralyzed or killed during a school shooting is something students have to worry about. "I saw people crying around me. One of my best friends had a panic attack in class," Vanchoff said. "Usually in those situations I'm calm. Like that's just the person I am. But I felt angry. I was like, 'Why? Why do we have to go through this?' Like why as students, when we should be thinking about our futures, do we have this threat constantly rolling off of our backsides, you know, like, I could lose my life today or I could be paralyzed or whatever." School shootings represent just a small sliver of gun homicides in the United States, and an even smaller number of gun deaths. Lauryn Renford, a 17-year-old high school student in Washington, D.C., has experienced a much more common form of gun violence: the deaths of young black men. "The first death that we experienced unfortunately in our school was my boyfriend Zaire Kelly and the second was Paris Brown, my classmate," said Lauryn Renford, a 17-year-old high school student in Washington, D.C.
"I think that we don't value lives the same," said Renford. "I think that when it's people that look like me dying we don't give that the same attention doing when it's people dying in a white suburb." "It's disappointing, especially in a city like D.C. that has been so historically black and so successful with black people in it," Renford said. "I don't think that that legacy has continued unfortunately. And I think we need to go back to that D.C. where we had community and people weren't dying left and right because they don't have resources that other people do." Adhiti Bandlamudi, Lisa Dunn and Alana Wise contributed to this reporting.